The LSC800 and the LSC1100 are small but tough machines built by MacKissic. They offer a small chipper chute which will chip branches up to 2-7/8 inches. 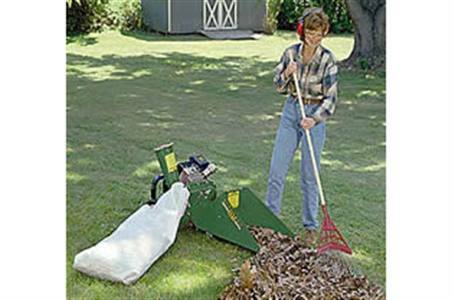 The large hopper is designed to shred leaves. Perfect for small yard clean up! 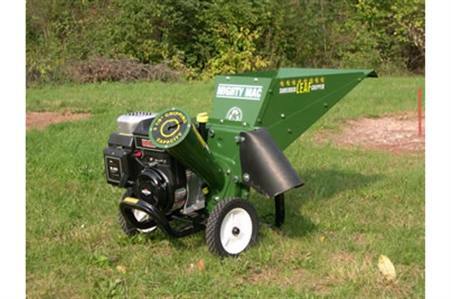 The leaf shredder-chipper is easy to move with the handles built into the shredder hopper. Once you have moved the machine where you need it, you can flip the kickstand into its up position and lay the machine on the ground. This allows for the operator to quickly and easily rake material into the hopper. Once in the shredder, the material is quickly pulverized, reducing leaves up to 8 to 1! The shredded and chipped material will make great mulch or compost! The compact unit does not take much storage space. For extended storage remove gasoline and store on the front bumper. Chipper Hopper Throat: 2-7/8 in. x 4-1/4 in. Flywheel Size: 13-1/2 in. x 1/4 in. Flywheel Weight (lbs. ): 17 lb. Shredder Hopper Opening: 20 in. x 22 in. Shredder Hopper Throat: 7 in. x 4 in. Storage Space (L x Wheelbase x H): 53 in. x 30 in. x 27 in.